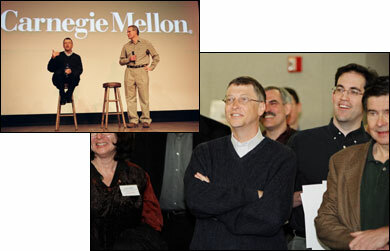 In his first visit to Carnegie Mellon last February, Bill Gates called Carnegie Mellon a "pioneer" in the field of computer science. Gates says the new facility will be a catalyst for future computer science breakthroughs. In the inset, Gates is pictured with School of Computer Science Dean Randal Bryant. Carnegie Mellon University has received a $20 million gift from the Bill & Melinda Gates Foundation to help fund construction of a new building dedicated to expanding the horizons of computer science. The new facility, to be named the Gates Center for Computer Science, will enable the university to broaden its leadership in this crucial field by providing more space to nurture important ongoing and new endeavors. The Gates Center is envisioned as a prominently located, 150,000-square-foot building that will bring a range of computer science activities together under one roof and foster more of the interdisciplinary teaching and research breakthroughs for which the university is famous, particularly in the areas like trustworthy computing and artificial intelligence, which are crucial to the future of computer science. The estimated cost of the new building is $50 million, with the foundation gift providing inspiration for additional fundraising. Plans call for moving the project forward as quickly as possible so that the facility is completed within three years from the time ground is broken. An architectural rendering of the new Gates Center for Computer Science. At left is Smith Hall and at right is Newell-Simon Hall. Proposed new green space is in the foreground. 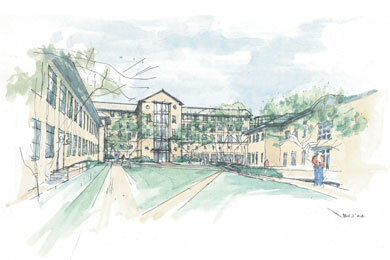 An artist's conception of the new building shows three entrances with one facing Forbes Avenue, the major Pittsburgh thoroughfare on which the campus is located. Preliminary plans call for the new facility to provide laboratory and office space for more than 80 faculty, as well as several computer clusters, two 100-seat lecture halls, four 50-seat classrooms and a 250-seat auditorium. "We thank Bill and Melinda Gates for the generous gift that will further outstanding work by this university," said Carnegie Mellon President Jared L. Cohon. "The Gates Center will be the new home for students, faculty and research laboratories that embrace our collaborative, problem-solving tradition in computer science. With its state-of-the-art facilities and resources, the new Gates Center will help us to continue to transform computer science with outstanding research and thinking, while visibly and remarkably transforming our campus with a bright new space for learning." Bill Gates, co-founder of the Bill & Melinda Gates Foundation, said, "Our goal is for this new building to be a catalyst for computer science breakthroughs. Carnegie Mellon is one of the top schools for computer science in the nation, and we hope the foundation's gift will help the school continue to excel and push the envelope of human understanding and innovation." The gift from the Bill & Melinda Gates Foundation reaffirms the significance of the contributions that Carnegie Mellon has made to the field of computer science over more than four decades. Since 1956 when computer science pioneers Herbert Simon and Allen Newell fathered the field of artificial intelligence by demonstrating that computations could be performed with symbols as well as numbers, Carnegie Mellon computer scientists have pushed the frontiers of the field, producing an astonishing array of breakthroughs in time sharing, speech recognition, multiprocessors, expert systems, robotics, computer chess machines and communication networks. Much of their work has been aimed at developing and building practical, knowledge-based artificial intelligence and programming systems. As a result Carnegie Mellon is recognized as one of the few universities to build real systems in the academic environment that have made their way into the commercial world and into the research agendas of government agencies. "Carnegie Mellon's School of Computer Science has been synonymous with research innovation," said Carnegie Mellon Trustee Raymond Lane. "The computer industry today owes much of its success to Carnegie Mellon research. The Bill and Melinda Gates Foundation, through this gift, is instrumental in helping assure this legacy into the decades to come." "This gift from the Bill & Melinda Gates Foundation represents a substantial investment in the future health of the field of computer science," said School of Computer Science Dean Randal E. Bryant. "By offering the very best facilities in which to learn and do research, we can engage the most promising students and faculty. These innovators and creative thinkers will transform the field of computer science, producing fundamental scientific breakthroughs, while also making computer technology even more beneficial to society." Sunil Wadhwani, CEO and co-founder of iGATE Corporation and a member of Carnegie Mellon's Board of Trustees, said the gift demonstrates confidence in Carnegie Mellon. "Carnegie Mellon has been a leader in the field of computer science, but I believe our biggest developments are still ahead of us. This gift demonstrates a confidence that we can create future scientific breakthroughs," he said. The School of Computer Science (SCS) was established as a doctoral degree-granting department in 1965; it became a college in 1988 and founded its highly regarded undergraduate program in 1990. The school includes six divisions  the Center for Automated Learning and Discovery, Computer Science Department, Human-Computer Interaction Institute, Language Technologies Institute, Institute for Software Research International and the Robotics Institute. SCS researchers are known for making breakthroughs that have real-world application in operating systems, programming languages, software engineering, wearable computers, ubiquitous computing, networks, educational computing systems and robotics. SCS researchers and faculty collaborate with colleagues across the campus, from science and engineering to fine arts and humanities to business and policy, enriching and being enriched by the cross flow of ideas and information. For more information about SCS, see www.cs.cmu.edu. The Bill & Melinda Gates Foundation works to promote greater equity in four areas: global health, education, public libraries and support for at-risk families in Washington state and Oregon. The Seattle-based foundation joins local, national and international partners to ensure that advances in these areas reach those who need them most. The foundation is led by Bill Gates' father, William H. Gates, Sr., and Patty Stonesifer.